Shiny Gold Helmcrab is an Endemic Life creature in Monster Hunter World (MHW). These animals and insects are found out in the field, and can be captured by dedicated Hunters looking to research the New World. This little one isn't too different from your regular Gold Helmcrab, but it's a lot shinier. Guess it hoarded more grub for itself? The Shiny Gold Helmcrab will sometimes spawn near the Fire Herb in the top-left corner of Sector 1, out on the sunlit rocks. It will also spawn in Sector 2 in the sunlit patch on the rocks above the lava fissure. Unlike the standard Gold Helmcrab, this creature is almost completely covered in gold and is extremely noticeable in the sunlight. 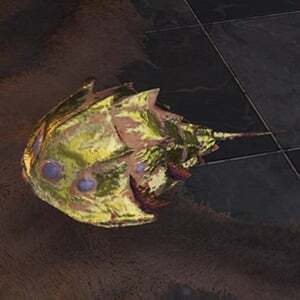 You can capture Shiny Gold Helmcrab by using the Fixed Item Capture Net, equip it via pushing Square/X when highlighting it, then use L2/LT to aim and R2/R2 throw the net at the creature. This creature was added in the Kulve Taroth update (Patch 3.0). When you stand near a Shiny Gold Helmcrab, an interact prompt will appear. Activating it will have you kick the crab, and it will leave behind a full stack of Dragon Pods. This creature is not necessary to unlock the Wild, Wild, Wildlife Guild Card background. Since this creature lives in the Caverns of El Dorado, which are only accessible during the Kulve Taroth event, it is only available for capture for a limited time.